It has been the goal and practice of the CLC Board of Missions to maintain a regular schedule of personal visits to the various church bodies we are privileged to work with around the world. Missionary Matthew Ude lives and works primarily in India with the CLC-India and the BELC, but part of his duties include annual visits to the West African country of Nigeria. During his visits there he meets with the leaders and many of the pastors and seminary students of the Nigeria-CLC. Because of security concerns, he is unable to spend time at the NCLC headquarters in Efa, but rather the leaders and pastors come to the large port city of Lagos for a pastoral conference. This works out well as leaders from our affiliate churches in Togo and Ghana are also able to attend this pastoral conference. Missionary Ude will be in Nigeria from January 9th-17th. Following his visit to West Africa, Missionary Ude will meet the chairman of the CLC Board of Missions, Pastor Todd Ohlmann, in the Democratic Republic of the Congo (DRC) where he will be introduced as the visiting CLC missionary to the ELCC and CCLC. They will spend their time in the DRC visiting with the leaders of these two church bodies, visiting and preaching at congregations of the ELCC and CCLC, meeting with the joint translation committee, and teaching at a joint pastoral conference. 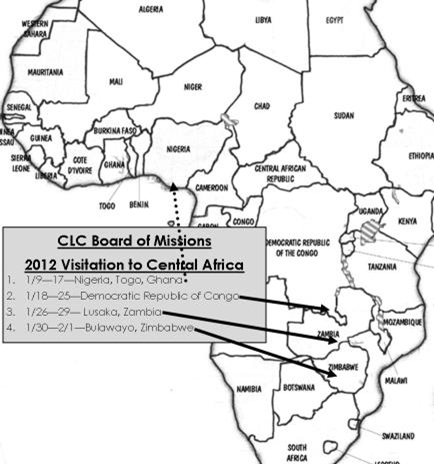 The CCLC has been active in conducting mission outreach over the Zambia border where new CCLC congregations have been established. The visitation team is looking forward to visiting these congregations to encourage them and the pastors with the truth of God’s saving word. After six days spent working with our brothers and sisters in Christ in the DRC, the CLC visitation team will travel to Lusaka, Zambia. They will meet with Pastor Ibrahim Karioki, who was trained at St. Peter Lutheran Seminary in Himo, Tanzania, before responding to a call from friends in Zambia to establish a confessional Lutheran church where proclaiming the whole truth of God’s saving word is the priority. The time of visitation will be short, but will allow an opportunity to visit the newly established congregations and meet with the evangelists that Pastor Ibrahim is currently training to be faithful shepherds. Following the Zambia visit, Missionary Ude and Pastor Ohlmann will travel by bus to Bulawayo, Zimbabwe to conduct the first face to face meetings with Pastor Apostle Liberty Atawa. (See article on page 2) A few days will be spent studying Scripture together as we strive to establish fellowship based on unity of doctrine. Please pray that the Lord will bless this time spent in His Word. On February 2nd, the two CLC visitors will part ways in Bulawayo, with Missionary Ude traveling on to Chennai, India to resume his work and Pastor Ohlmann returning to St. Louis, MO.